The most used collections I have are for my TV series, movies, books and purchase tracker. Oooh awesome!! I’ve been debating weather or not I want to buy a copy! My most useful lists are all my Bookish ones because I obsessively track my reading progress and goals. But I’m currently working on a new list to help track the little ones reading/writing/general learning progress through her first year of school! I have so many lists and collections. I just did a collection of nail polish colors. That was fun to do. I also have sample pages of Washi tape organized by color. I guess my favorite is my list of DisneyMovies I’ve seen. I add to it as I see new ones come out. It gives me a good excuse to watch with my grandkids. I only have a few that I’m missing. 2. My to do list. My diary is called the oracle as it tells me where I need to be when, and what I should be doing!! My favorite collection is my Books Read. I’ve seen a lot of others in the comments who love their same list! I am an avid reader, and there’s something about closing the cover of a book and immediately opening my journal to that list that makes finishing SO SATISFYING! My most useful lists are my brain dumps. Sometimes I just need to get ALL of the stuff out of my head so that I can figure out what to do next. I am starting a new and hopeful list. Amazing things to do, to see, and to enjoy -after i finish closing a long chapter of my life- a relationship. I’m almost there. Great blog and IG! Thanks for the chance to win. My favorite page is my weekly pages… set up to work just for me. I have a dutchdoor set up that keeps me listing all that I’ve committed to in the week…it’s made me say no to lesser items and yes to more of the important ones. This year my favorite collection is my fall bucket list. My spending log is a close second. My most-used collection is Books to Read/Books read. Kinda boring, huh? 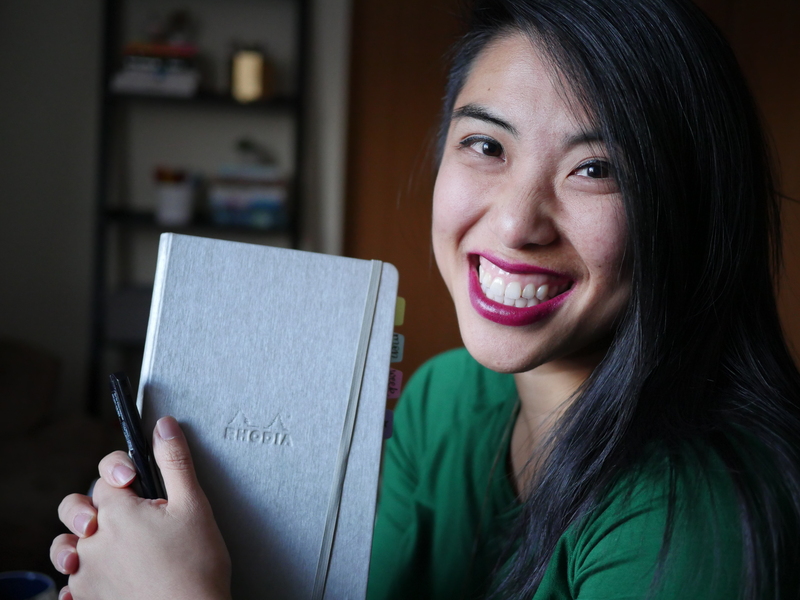 I’ve been bullet journaling non-stop since 2015, and it has changed my life. Even my husband was amazed at how well it worked for me, and a year after I started, he abandoned his Franklin-Covey software became a convert. He likes the original embossed black Bullet Journal and his style is very different from mine, but he loves the system. My most useful collection is my monthly habit tracker. This has allowed me to develop and break the best and worst of my habits. I started tracking no alcohol days which I then turned into monthly challenges. And I’ve lost 10 lbs in one month thanks to a motivating tracker! As a beginner bujo user, I would utilize this book to its fullest potential!!! I hope to blossom into a wonderful addition to the bullet journal community. Peace and love to you all. My to do list is the most important. I’ve got so many things to do, i forget if i don’t list them out. The most used collection I have is probably a tie between my reading log and my to watch list, but the most useful/practical that’s had a huge positive impact is our bill and savings tracker! 2) I am currently needing to rethink my entire system and process having gone from working adult to stay-at-home-mom. Life is totally different, but there is still things to get. But in the past, my most helpful part of my BuJo was the combination of my weekly and daily spreads. Once I got this process and system down, life became SO much less stressful. I am still using them, but I’m needing to revamp them to work for my more flexible, but OH SO MUCH MORE HECTIC life (#momlife). Two things I am striving to do more of are reading and exercise. I am working on a creative way of tracking both of those things. Oohh I’ve decided that I want to start a bullet journal in the coming year, so this would be perfect! I’m @HannahHa on Instagram, and I live and die by my to-do lists, separated into the different domains of my life: Family/Personal, Work, Side Hustle, and School! Hi, I’m @anju.susan.george and I really love my books to read collection and distress relief list. I wish to do more collections that have to do with doing more creative things. My lists are tracking what I need to do for my job weekly and monthly. I am trying to setup a weekly health plan and tracker that tracks my weight, water intake, food and workouts. Still in the works though. My favorite collection right now is my 19 Before 2019. This is a list of things I want to do/see/experience this year …. like plant flowers in my front yard, take a spin class, try acupuncture, and rate/review my favorite podcast (Happier with Gretchen Rubin…. so good!). It’s fun to make the list and even more fun to go/see/do each one! My instagram handle is jozburn and I think my most useful lists right now are books I’ve read and listened to. I don’t keep many lists right now, but I’m excited to dive into bullet journaling a little more! Thanks for the chance to win! My Instagram handle is @j_journalz_j_planz. My most useful and dearest collection that I am currently working on is My Grandmother’s Homemade Recipes. My most helpful list corrals a bunch of info for a website I help maintain. Find me on Instagram at @princapecos! Choosing ONE favorite feature is hard. I guess the feature that is most helpful is my monthly layout in my writing bullet journal. It’s my dashboard to track the status of all the different projects and jobs I need to do. My favorite layout is my habit tracker. It’s the perfect tool to feel direction in my life and ease the anxiety of starting a big task. For me the most useful list is the one I have for UNI. Not really the one for my soul but it has to be done. Otherwise I can’t live without my Travel Destinstions Collection as it gives me motivation to no procrastinate and get stuff done so I can live my best life. I love writing down books I want to read in the future!! The most important in my Bujo would have to be my habit trackers but my monthly reflection pages are up there too! My favorite collection is my birthdays/anniversary/last contact collection. My IG handle is JaneChristieD. My most useful collection is my research pipeline for work. I’m @jenniferzyren on instagram and my most useful collection is my period tracker. I used to go into doctor’s appointments forgetting exactly when my last period was: now I know! So helpful. Definitely has got to be my giant to-do list! My Instagram is astralgia. My most useful page is my sleep log where I’m documenting a 30-day sleep challenge that will help improve the quality of my sleep. I am SO bummed I missed this giveaway! I am a total list maker and I think this would be an awesome method for me to start doing!